The Reserve Bank of Australia unveiled a new $5 note on Tuesday, eliciting howls and complaints from social media users. The reviews were decidedly harsh: "Visual vomit," said on Twitter user. "Monopoly money," said another. The central bank said the new note, which will enter circulation on September 1, retains the same color and size of the previous edition. But the new version has an updated look, improved security measures, and a "tactile" feature to help the visually impaired. 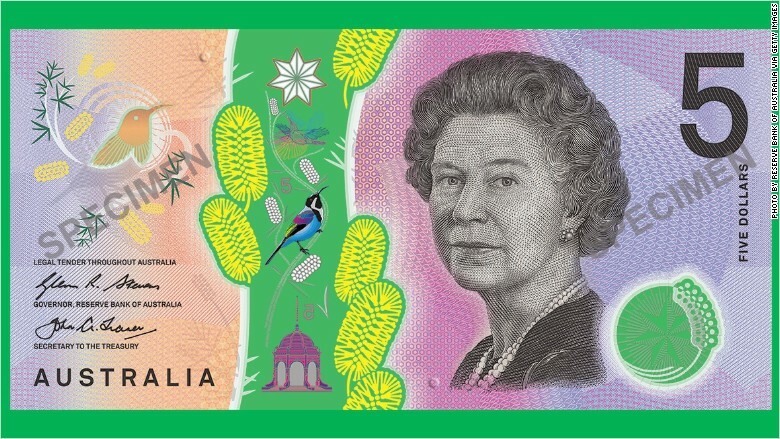 The new $5 note also features examples of distinctly Australian flora and fauna -- the Prickly Moses wattle (a plant) and the Eastern Spinebill (a bird). The front of the note includes a portrait of Queen Elizabeth II. Social media users were not impressed, with most saying it has a slapdash appearance. "So it takes 6 months to produce $5banknotes Think we need to replace RBA if this is the best they can do #6months @AustralianLabor," tweeted @denni_swill. "Talk about ugly, how many meetings for this atrocity to be picked?" tweeted @Bishop64. "I don't like it, sorry guys :(" tweeted @kilkakon. While most reviews were negative, at least one user found something nice to say about the note. "I really like these! I think they'll be great for the Visually Impaired community in particular - I think people forget that," said @Subsequent. @RBAInfo I really like these! I think they'll be great for the Visually Impaired community in particular - I think people forget that. 💙!